Kids learn through play, right? What tools are available that will help the grandkids be excited about learning? When you live far away from your grandkids, what can you send them that will excite them and spark the imagination? I want to find something fun AND educational. It’s awesome when it works out! After reviewing several craft box subscription based companies, we decided to try Green Kid Crafts. Not only are the projects fun, imaginative and attention-grabbing, but they are also created from eco-friendly, recycled and sustainable materials. 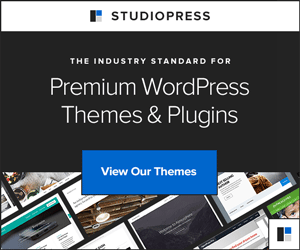 Affiliate links provided for your convenience. See our policy here. Green Kid Crafts did not sponsor this review and I paid for my own kits. Check out these other gift ideas for you & the grandkids! The grandkids thought it was all about fun, when really it was all about learning. Opening the Green Kid Crafts box was exciting. And then, the projects kept the kids engaged and giggling! Talk about a win-win! Does it pass the kid test? Yes! 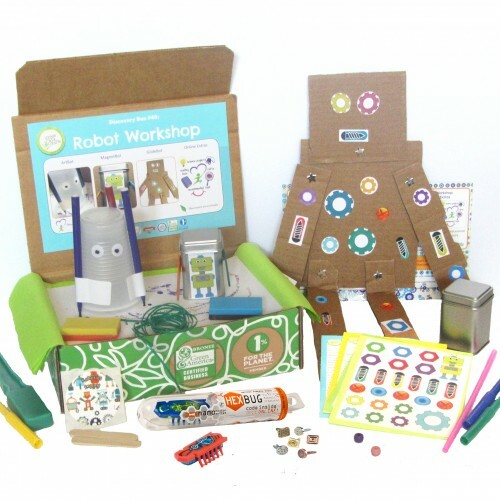 Bree (age 6) received the Robot Workshop box. She was immediately drawn to the Hexbug Nano Robot, so she used it to create the ArtBot. Bree was able to complete the project by herself and was delighted with her bug pushing the cup around to create his own art. She continued to play with the bug even after his art project was completed! 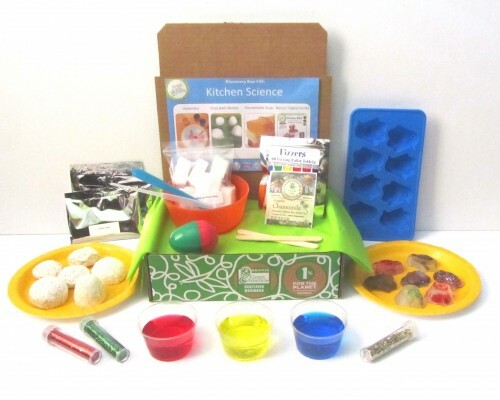 Sisters Jilli (age 8) and KJ (age 5) shared the Kitchen Science box. Jilli chose to be in charge of the Bubbling Volcanos project. After supplying them with a plate and some vinegar, the girls spent the next hour creating their little volcanos and experimenting with color mixing. Does it pass the (grand)parent test? Yes! 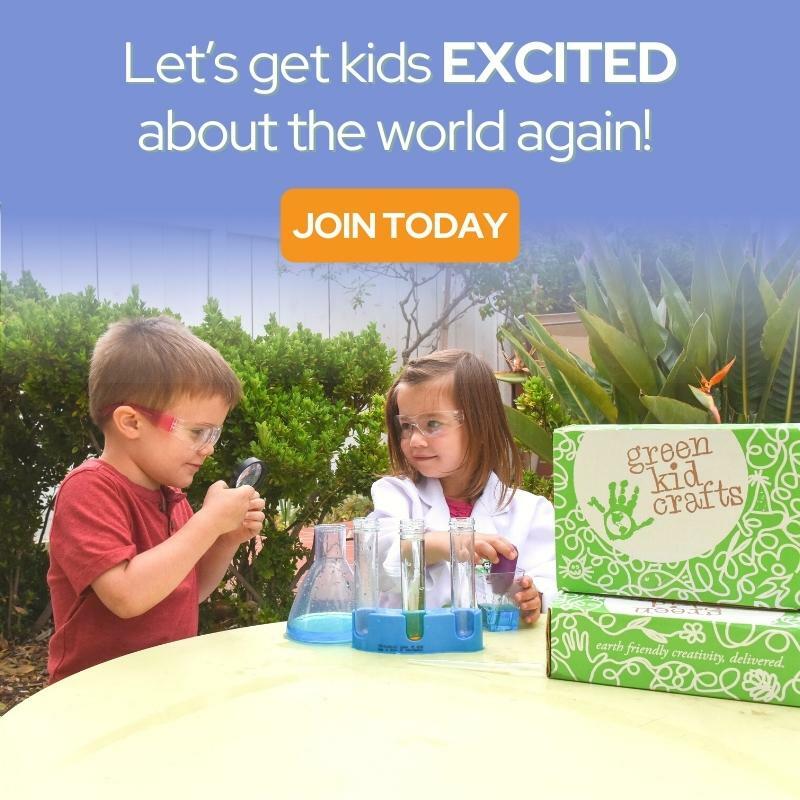 Green Kid Crafts uses STEAM (Science, Technology, Engineering, Arts and Math) to inspire kids to see themselves as makers and creators. The kits include additional information to help you facilitate conversations by discussing what is happening, asking questions, and allowing the kids to measure, design, and build. Green Kid Crafts helps kids to build their problem solving skills and to gain confidence and curiosity to tackle problems where there is no one right answer. Included free for subscribers is an exclusive online collection of additional activities, reading lists, games, and experiments each month, all centered around the monthly theme! You never know when you order a subscription box if it’s going to be all that you hoped it would be. I’m happy to report that these kits were all we had hoped they’d be – plus more! Green Kid Crafts gets a big “thumbs-up” from my granddaughters (and from me)! You don’t have to take my word for it – see more reviews here. 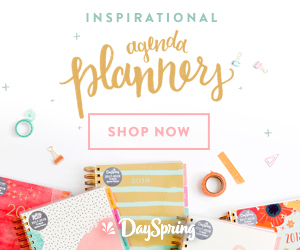 Pin this post by clicking here! I always like it when someone tries something for me first. Thanks for your review, we may have to look into this!